Edinburgh Fringe BBC News crisis comedy – and without Jimmy Savile! At the Edinburgh Fringe in August, there will be a play titled Making News about a newly-installed female Head of News at the BBC who has to handle a breaking story about the corporation itself, a TV reporter frustrated about a story she can no longer sit on and the fallout from the decisions taken that “threatens to bring down the BBC”. In 2011, the BBC’s flagship current affairs programme Newsnight conducted an investigation into DJ Jimmy Savile, a former Top Of The Pops and Jim’ll Fix It presenter. The investigation was never screened by the BBC. When allegations of paedophilia were subsequently broadcast on ITV, the BBC was accused of a cover-up and another Newsnight report wrongly implicated Conservative politician Lord McAlpine in the widening child abuse scandal. 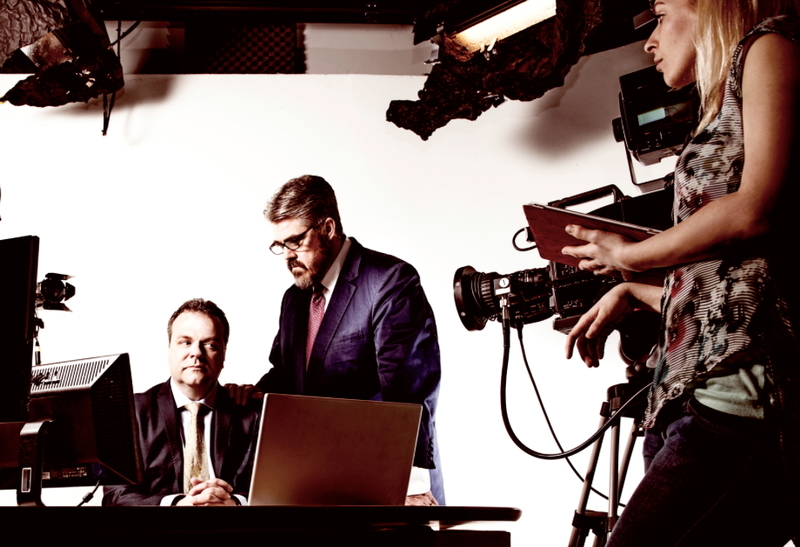 Making News has been written by Robert Khan and Tom Salinsky, who had a big success at last year’s Edinburgh Fringe with their political play Coalition about a fictional British coalition government. Britain currently has a coalition government. Robert Khan studied law at university and is now a Labour councillor in Islington. Tom Salinsky studied mathematics and now runs training company The Spontaneity Shop. He also co-wrote The Improv Handbook with Deborah Frances-White. 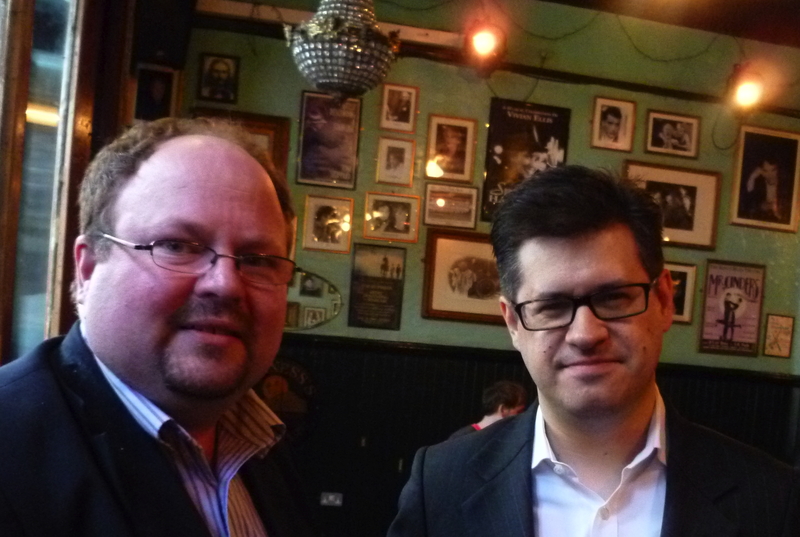 I had a chat with Robert and Tom at the King’s Head Theatre in Islington last night. “Improvising,” explained Tom, “is like solving problems at 100mph. Improvisation’s really about making a series of choices and the delightful thing for the audience is they get to see the moment of inspiration – that moment of creativity – actually happen in front of them. “Aahhhhh…..” said Tom and Robert in unison. “… but once it’s on stage, it’s discouraged,” continued Tom. “And you’re both heavily into politics?” I asked. “So why write two plays about politics?” I asked. “I think it’s interesting to begin with…” started Robert. “And the strange thing is the BBC does,” I said. “Have either of you worked for the Beeb?” I asked. “Picture research?” I asked, surprised. “So what’s your insight into BBC News?” I asked. “But we can’t talk about that,” Robert told me. “Some fairly senior people within News,” Tom added. “Have you talked to any of the people you’re parodying?” I asked. “And we stress that very heavily,” said Robert, carefully. “We are looking,” said Tom, “at What does being in that position do to you? When you come under these pressures, how might you react? “I don’t think we need to do a pastiche of real characters,” said Robert. “We create our own characters to inhabit those roles,” agreed Tom. “It could be a tragedy rather than a comedy,” I said. “It’s a very, very difficult job,” agreed Robert. “When did you start writing Making News?” I asked. “During the Edinburgh run of Coalition last August,” said Tom. “So before George Entwhistle became DG?” I said. “Do you envisage a TV version of Making News?” I asked. “I don’t think it would be on the BBC!” laughed Robert.